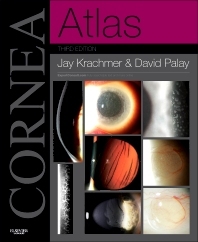 Get an unprecedented view of corneal disease with Cornea Atlas by Jay H. Krachmer, MD and David A. Palay, MD. Hailed as the sharpest, most accurate collection of corneal images available, it is the only atlas that offers such an easy-to-understand, up-to-date review of clinical presentations and surgical techniques for all corneal and external eye disorders. "I have decided that I am going to buy this book for every rotating ophthalmology resident and give it to them to read and study (and keep) at the beginning of their cornea rotation!" Sharpen your diagnostic and surgical skills for all corneal and external eye disorders - including tumors, dystrophic and degenerative disorders, inflammatory diseases, corneal manifestations of systemic disease, traumatic injuries, and therapeutic and reconstructive surgical procedures. Rely on the expertise of internationally renowned ophthalmologists who have developed many innovative techniques for diagnosing and treating corneal and external eye diseases.